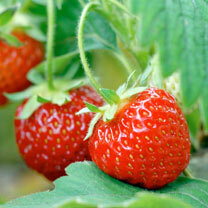 “A mid-late season variety producing glossy red fruits, perfect to follow on from ‘Honeyoye’. The fruit are sweet and juicy, while the plant is less susceptible to mildew than many other varieties, meaning healthier plants.” RHS Award of Garden Merit winner. Harvest late June-July.